In previous versions of Rainway, we spent a lot of time improving our Motion Stitched Graphics (MSG) pipeline and, while our ability to capture and encode saw monumental increases to performance over the last few months, as we started building our new self-learning adaptive bitrate algorithm the cracks started to show. To solve these problems and more importantly improve our user experience, we built Pulsar, a powerful game streaming engine that has been meticulously crafted to enable ultra-low-delay gameplay. Among Pulsars improvements are our new and improved zero-copy framework which is unique in its versatility by allowing the use of multiple GPU’s and also mixing two different brands for the best performance. Improved frame timing also allows the stream to remain consistently smooth so you’re able to dominate in all your favorite frame sensitive games. With the introduction of Pulsar also comes a brand new AMD encoder. It has a lot of fine-tuning under the hood that was not possible with the MSG variant and offers improved streaming. 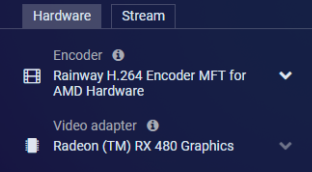 We’ve also included increased compatibility with most recent Radeon GPUs starting with the Southern Islands family and APUs of the Kabini, Kaveri, Carrizo families and newer. If you are a user with an AMD system we recommend giving it a test drive — we will be phasing out the MSG version of the encoder in 0.7.0 and introducing a new Intel encoder. When it comes to game streaming, latency is more than just a number, you are able to feel physical delay, making things like accurate pointer rendering or general precise input hard when done poorly. To tackle this issue we created a new algorithm we call predictive input rendering. Using our algorithm, we can predict mouse movements and render relevant frames ahead of time, substantially reducing any physical feeling of latency that comes with interactive media. The red square in the above gif represents where the physical cursor on the host machine is located with the white cursor being rendered by the client. Now, relative movements and pixel perfect input feel just as if you’re sitting in front of your PC at home and you can enjoy your favorite rhythm games on the go. Mouse acceleration on your host machine can cause desynchronous movement and we suggest turning it off. While we work to build native applications for iOS, Android and other platforms it is important users still have some means to enjoy their PC games on portable devices. We spent a lot of time on 0.6.0 optimizing our processing and handling of data to make low-power devices more efficient at decoding. The results reveal that devices like the Intel Compute Sticks, some Android tablets and other unique devices can enjoy Rainway using nothing but Chrome. LINX Vision tablet distracting us at work. You can now also press three fingers to the screen on mobile to toggle fullscreen mode. Games now scan exponentially faster with our new Nexus caching layer. Whereas before game metadata had to be pulled from the user side on a per-game basis, we now intelligently pre-fetch relevant information on our end. This means on larger libraries game scanning has been reduced from minutes to a few seconds. In addition to this, we fixed numerous bugs in our game analyzer and introduced support for the Discord Store, Bethesda Launcher and restored support for Epic. Fixed an issue where Rainway would disconnect in China. Fixed a rare bug with Task Scheduler causing crashes. Fixed an issued where the game list would not appear when connecting too quickly. Patched a vulnerability in YAML. Added diagnostic mode to the tray icon. We hope you’ve enjoyed reading through our latest changes and that this new update resolves any issue you might be having. If you ever need support, you can join our Discord here.